Baruch, the scribe (Hebrew, sopher), served as the amanuensis or secretary of Jeremiah the prophet. A few years back a bulla of the seal of Baruch the scribe was discovered during an archaeological excavation in Jerusalem. A bulla is a piece of hardened clay bearing the impression of a seal. A scribe working in the synagogue at Masada. Photo by Ferrell Jenkins. 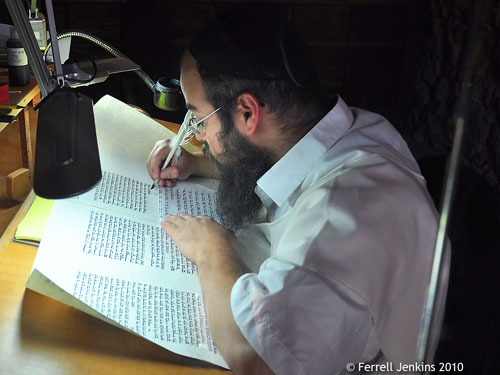 A scribe was copying a manuscript in a small room of the synagogue at Masada last May. This was the first time I had noticed a scribe there. In the days prior to the invention of the printing press the scribe played a highly significant role in society. This entry was posted in Archaeology, Bible Study, Israel, Old Testament and tagged writing. Bookmark the permalink.